Hi everyone, Kirsten here again, happy Saturday & happy July 1st - half the year gone already!! My project today is another of the That's Crafty! 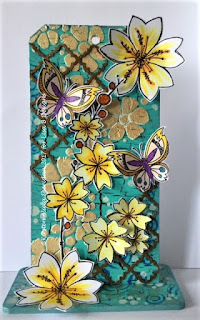 MDF Uprights I decorated for Lisa's PaperArtsy workshop at the end of May. This is the Tag Upright & I painted it with black gesso before adding a layer of Imagination Crafts' Crackle Medium, over which I painted a layer of Bahama Blue Americana Acrylic paint. 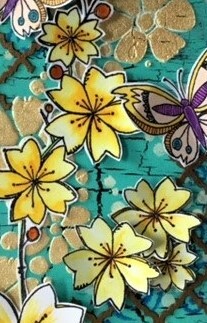 The next layer was Structure Paste through the flowers of PaperArtsy stencil PS008. This I did a few times, working my way up the upright. Obviously, I had to wait for the previous layer of Structure Paste to dry, but as Imagination's SP dries so quickly this didn't take long. When the last layer of SP was dry I replaced the stencil & stippled White Gold Starlights through it. The next stencil layers were Ultramarine Americana Acrylic paint through PaperArtsy stencil PS034 & Titanium White Americana Acrylic through PA stencil PS001 to finish the background. I painted pieces of Imagination's Moroccan Trellis Magi-Cutz with Topaz Starlights & added them to the upright & I stamped the flower spray from JOFY32 directly on top - this gave me the stems & the outline of a few of the flowers, enough to work out the placement of the actual flowers. Thanks for visiting the blog today, have a lovely weekend. Labels: Americana Acrylic Paint, craft classes, Deco Art, Imagination Crafts, Lisa B Designs, magi-cutz, Maidstone, MDF Upright, PaperArtsy, Starlights, structure paste, That's Crafty! Scrumptious textures - love that trellis - and it's so clever how you allow the eye to travel up the wall. Brilliant composition.